15th May 2018 is the 70th anniversary of Palestine's Nakba when 750,000 Palestinians - out of a population of 1.9 million - were forced into exile, refugees from their own country, as the state of Israel was created.Yesetrday 55 unarmed Palestinian demonstrators were shot dead by Israeli foces with 120 suffering horrific gunshot wounds. Enough. 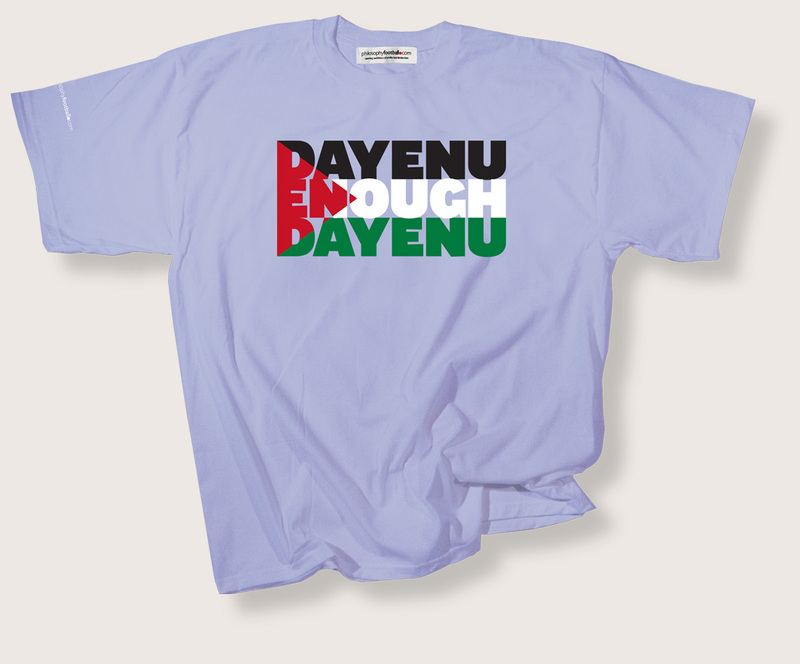 'Dayenu' is a song that is a key part of the Jewish festival of the Passover. Loosely translated it means 'it would have been enough', giving thanks for the escape from slavery and the exodus from Egypt. More recently it has been used to demonstrate oppostion to anti-semitism. Available in unisex sizes small (36 inch chest/90cms), medium (40inch/100cms), large (44inch/110cms), XL (48inch/120cms) and XXL (52inch/130cms). Available as listed in drop-down menu below. Gift Wrapping service With exclusive Philosophy Football wrapping paper and gift tage. To personalise your tag type the message you would like us to inclyse in the box below.